As the market is crowded with options for container and Kubernetes management—from Red Hat's OpenShift, GKE from Google, and EKS from AWS—on which vendor should you rely for your organization’s container and cluster management? 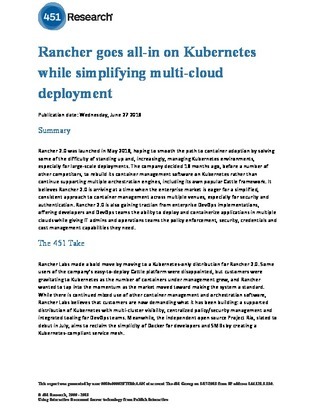 Download this 451 Research report for a close-up look at one solution, Rancher 2.0, which aims to simplify container adoption by solving some of the difficulty of standing up and managing Kubernetes environments. Inside, the platform’s strengths, weaknesses, and opportunities are addressed, as well as how it eases multi-cloud deployment.